Scott Halasz | Greene County News Air Force Chief of Staff Gen. Mark. Welsh III passes the Air Force Materiel Command unit flag to Gen. Ellen Pawlikowski during Monday’s change of command ceremony. 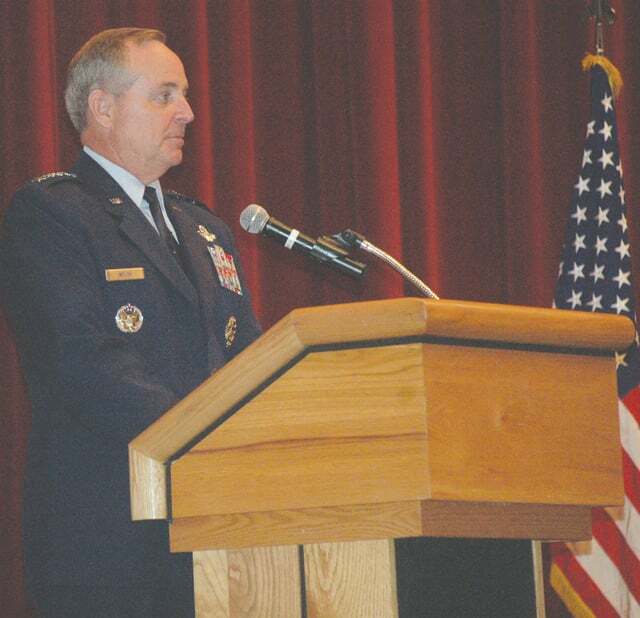 Air Force Chief of Staff Gen. Mark Welsh III addresses the crowd during Monday’s ceremony. WRIGHT-PATTERSON AIR FORCE BASE — A historic change of command ceremony took place Monday when General Janet Wolfenbarger passed the flag to General Ellen Pawlikowski. It marked the first time a female four-star general turned command of Air Force Materiel Command over to another female four star general. Adding to the legacy created inside Kenney Hall at the Air Force Institute of Technology is that Wolfenbarger is the first four-star general in the Air Force and the first to lead AFMC. Pawlikowski is the third. Wolfenbarger took over the reigns of AFMC — which conducts research, development, test and evaluation and provides acquisition management services and logistics support to keep Air Force weapons ready for war — in June 2012 and oversaw a large reorganization and restructure. Now Pawlikowski — in her third assignment at WPAFB — will guide one of the Air Force’s most critical divisions as the war on terrorism continues. Pawlikowski was first assigned to WPAFB from 1997-1999 in the Aeronautical Systems Center. She came back from February 2010 to May 2011 as the commander of Air Force Research Laboratory. The Bloomfield, N.J., native still has strong affections for the Miami Valley.